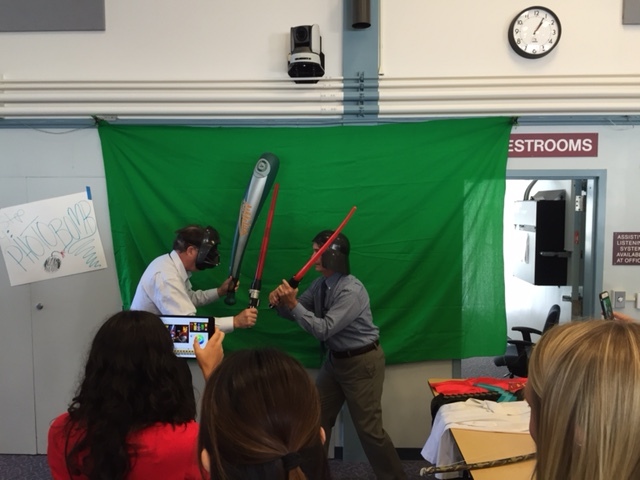 Here’s my share out after Dublin Unified had its new teacher Boot Camp. Over three days approximately 50 of the 70 new teachers in Dublin Unified came to a boot camp that was offered to them and they were not paid for their time. They arrived enthused and ready to learn. A day and a half into the boot camp, they were turned over to the technology services department for the remaining day and a half of professional development. As you read in part one, we chose to do things just a bit different. 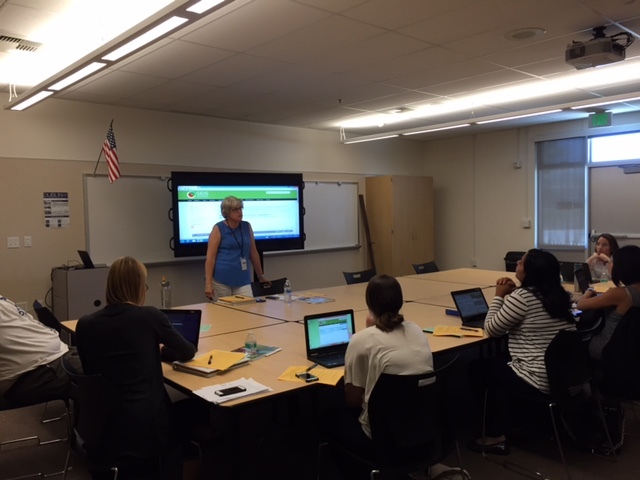 Teachers had an opportunity to check out new laptops and do the regular required paperwork. They were asked to log into the computers so we could verify they knew how to also log into Google and that began their journey with Technology Services. Once they arrived back at the Board room, they were met with a personalization station to decorate their laptops with stickers that were meaningful to them promoting positive sayings as the students will be looking at those laptops all year long in class. I giggled as I saw many teachers stare at me in dismay as I encouraged them to deface their laptop cases with stickers. I knew right there that was a foreign concept to many of the new and veteran teachers alike. Once they decorated their laptops, they were encouraged to go to the green screen station and create fun images that could be added to their webpage, Google profile, and or just for fun in their first agenda. The staff in this image are our Superintendent and the Assistant Superintendent of Educational Services (the new teachers loved seeing them! & the green screen APP master is my soon to be freshman!). Day one ended with an exit ticket requirement I had that they have one page of their website built with contact information and a photo so that parents knew how to get a hold of them as early as days before the first day of school. 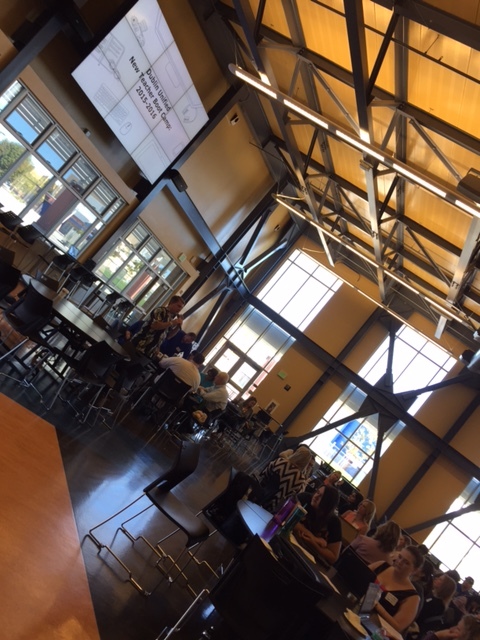 Day two began in the student union at our one high school in Dublin Unified. 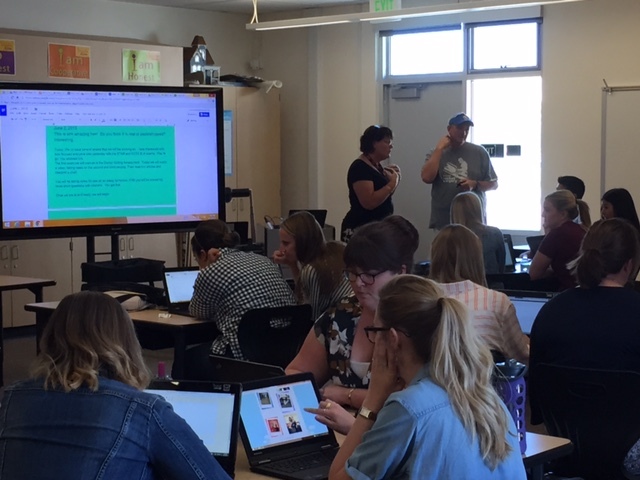 Teachers were taken through an adventure game that led them to an opportunity to work in teams for the next two hours on one deliverable due at the end of the morning session. 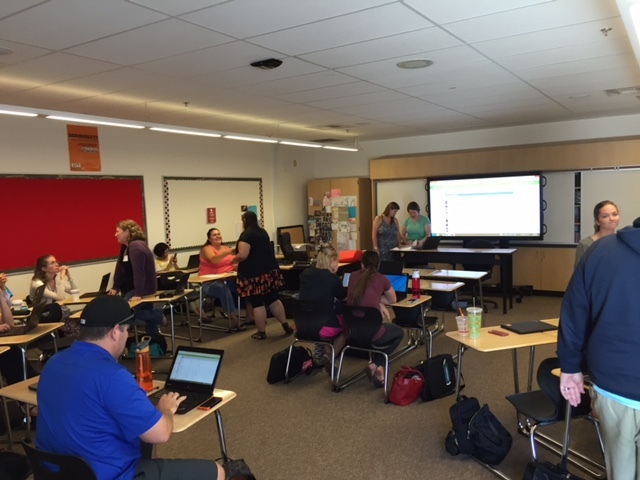 The exit ticket for the morning session was the first day agenda, some teachers opted to do Google forms and getting ready for back-to-school night, other teachers begin working on their classroom website. All in all, it felt like a very productive morning and we received many compliments from Directors. Teachers shared that they really enjoyed the space and time to work, network, and focus on one deliverable due mid morning. During their hour-long lunch, many teacher stayed around for Twitter 101. I walked them through the value of Twitter as a PLN and encouraged them to create accounts even if they intended to only lurk on Twitter. I sang praises for the value of Twitter as an ongoing PD and networking tool that they can tap into for themselves and in classrooms with their students throughout the school year. The afternoon sessions were hands-on and by the end of the sessions teachers got a chance to do even more work in systems that they would be using on a regular basis and would need exposure to. In addition, they had exit tickets to have certain elements of those program set up prior to leaving for the day. The same model is how we will conduct our first August PD for staff prior to the school year. Stay tuned for the next post that will outline the menu of items that will be available to teachers to pick and choose sessions throughout the day based on their individual needs.